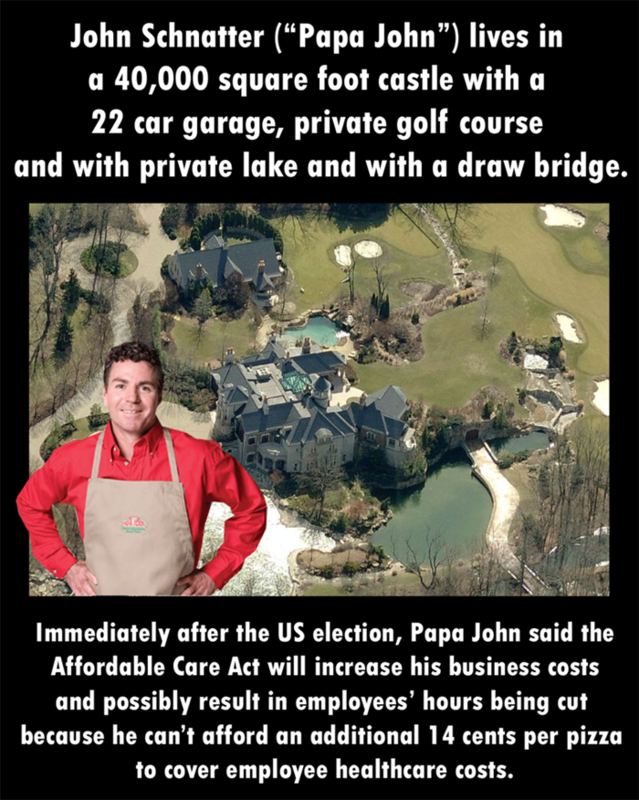 In light of Papa John's Pizza CEO John Schnatter's intention to cut his employees hours so that he doesn't have to provide them with health care (at a cost of less than 15 cents a pizza), conservatives are calling Friday, "National Papa John's Appreciation Day." It's also being called, "National Make Uninsured Minimum Wage Employees Work Twice As Hard While You Protest Their Right to Health Care and Hope They Don't Spit In Your Food Day." Some people are calling it, "Help Papa John Schnatter Recoup the Millions He Wasted on Romney Campaign Contributions Day." It's kind of like election day all over again, except this time people are voting with their wallets. You can take a stand for free enterprise by giving your business that day to a local restauranteur, who would no doubt put the profits back into the community as opposed to stashing them in the Cayman Islands. Maybe I'll go to Square Pizza on Friday ... they've got awesome old-school video games. I appreciate Papa John because he makes me feel better about myself. 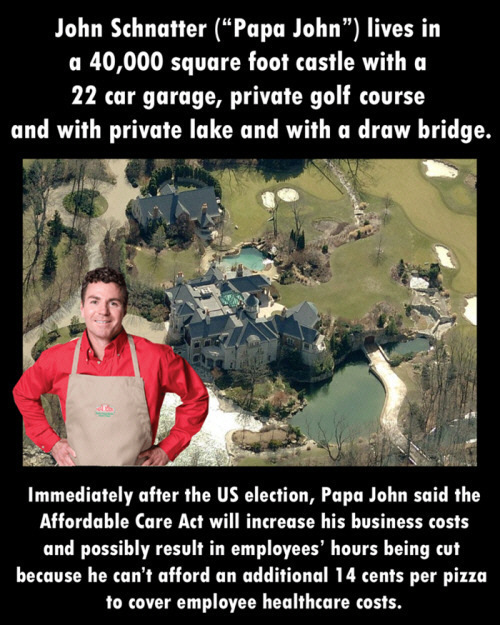 Well never did like Pappa John pizza and now have a very good reason to never try it again. But afraid we are going to see a lot of this crap. Begining to think we are going to see the so call full time employee become a minority. Yup sad chain of events that is being sold to use as making things better is in fact just going to make them worse.